Christ, as a light illumine and guide me. Christ under me; Christ over me; Christ beside me on my left and my right. Be in the heart of each to whom I speak; in the mouth of each who speaks unto me. May the peace of the Lord Christ go with us, wherever He may send us. May He guide us through the wilderness, protect us through the storm. May He bring us home rejoicing at the wonders He has shown us. May He bring us home rejoicing once again into our doors. The word of the Lord came to Jonah son of Amittai: "Go to the great city of Nineveh and preach against it, because its wickedness has come up before me." But Jonah ran away from the Lord and headed for Tarshish. He went down to Joppa, where he found a ship bound for that port. After paying the fare, he went aboard and sailed for Tarshish to flee from the Lord. Then the Lord sent a great wind on the sea, and such a violent storm arose that the ship threatened to break up. All the sailors were afraid and each cried out to his own god. And they threw the cargo into the sea to lighten the ship. But Jonah had gone below deck, where he lay down and fell into a deep sleep. The captain went to him and said, "How can you sleep? Get up and call on your god! Maybe he will take notice of us, and we will not perish." Then the sailors said to each other, "Come, let us cast lots to find out who is responsible for this calamity." They cast lots and the lot fell on Jonah. So they asked him, "Tell us, who is responsible for making all this trouble for us? What do you do? Where do you come from? What is your country? From what people are you?" 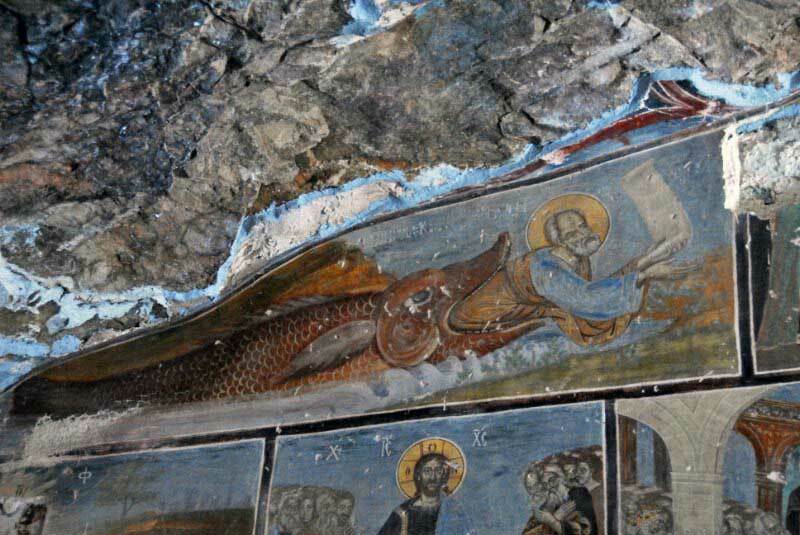 This fresco is found in an ancient church in eastern Turkey. Jonah's big fish looks more like a giant sturgeon than the traditional whale.